Our morning dawned crisp and blue. In the woods, we knew that the trails would be firmly frozen, the mosquitoes still far from flying, and perhaps the ticks would be hunkered down, too. The novelty of this snowless, chilly spring weather is a perfect match for a hike on the North Country Trail. As we entered the brushy, deciduous forest and strode down the leaf-littered path, I felt my heart quicken and thud in my chest. After a moment, the sensation reached my ears, too. It wasn’t my heart – it was the drumming of a Ruffed Grouse! I’m always amazed by how much I feel their sound instead of hearing it. In the thick of mating season, their incessant, accelerating beats have even caused a fleeting catch in my breath as they temporarily overpower my own body rhythms. The grouse drummed again; thumping slowly at first, and then crescendoing into a rapid-fire blur. As his last vibrations dissipated into the still air, another grouse answered from a neighboring territory. The low-frequency sounds are audible from up to a quarter mile away. 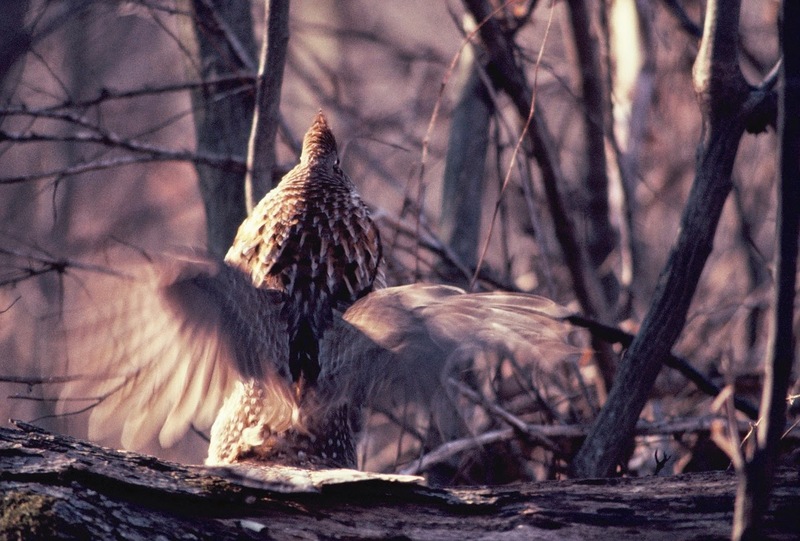 Over the years, we’ve employed several explanations of how ruffed grouse create this sound. Because male grouse often display from atop a hollow log, perhaps they created the sound by actually hitting the log with their wings. Or, since they also display on rocks, mounds of soil, or prominent roots, perhaps the sounds comes from the wings striking together behind the birds’ back, like a spruce grouse. Those explanations were discredited in part due to some fuzzy photographs of captive Ruffed Grouse by Professor C.F. Hodge of Clark University in the early 1900s. H.E. Tuttle spent many days in blinds observing drumming grouse from 1910 to 1918, and published his findings in the American Ornithologists' Union’s journal, “The Auk.” Tuttle examined Hodge’s photos and agreed that the sound did not come from wings beating together. He posed the possibility that rudimentary air sacs contribute to the sound (as in the displays of greater sage-grouse). As in many realms of science, as the technology improved, so did our explanations and accuracy. In the 1920s, Arthur Allen of Cornell University used a new-fangled contraption to shoot motion-picture footage of the grouse. By slowing down the movement, he ruled out every explanation except the one that we currently accept. That thumping sound wave sends “the blood sap pulsing quicker along the veins…” (Tuttle again) not only for humans, but also for the lady grouse. She can probably differentiate between different males, since the number and rate of pulses in each bout of drumming is unique to each individual. Tuttle noted that if he rustled the leaves in his blind to sound like the dainty footsteps of an approaching female grouse, the male would drum instantly, and also flare his name-sake ruff of neck feathers. Once he’s able to attract a female with this huge output of energy, copulation lasts only a few seconds. The female then wanders off to build a ground nest and raise the chicks completely on her own. Hiking down the trail, we found many clusters of sawdust-filled grouse droppings. Those piles marked where they had digested tree buds and catkins on sub-zero nights while buried snugly in a snowdrift. In one balsam thicket we heard – but did not see – the whirr of a grouse’s startled explosion into flight. We have to admire their tenacity of these year-round residents, even if we sometimes chuckle at their lack of grace. Now, as the days lengthen with the promise of spring, we can also appreciate how grouse’s drumming seems to jump-start the pulse of a waking forest. “Wow. Look at the stars,” said Drew as he stepped out of the car. With no moon, they glittered brilliantly in the inky black sky. I paused from unloading the car, and gazed heavenward with him. Breathtaking. I love living in the middle of nowhere. But after I closed the car door, and even the dome light went dark, a sound penetrated our consciousness, too. Hoo. Hoo. Hoo. Hoo. The repeated note sounded kind of like a back-up beep, or the car’s warning ding that I left my lights on or the keys in the ignition. But all was dark, the keys were in my hand, and no engine noise accompanied the mystery. Suddenly my synapses zapped, the sound registered, and my eyes lit up in the darkness. “It’s a saw-whet owl!” I grinned, excited at the prospect of a new avian neighbor. The last time I heard the incessant (and somewhat annoying) call of a saw-whet owl, I was in the Sierra Nevada mountains of northern California. From there to Wisconsin seems like quite a stretch, but saw-whets breed in mature forests with an open understory from southern Canada to the northern and western United States. While their habitat preferences are pretty well understood, the movements of saw-whets are not. Granted, it’s hard to track small things that are well-camouflaged and only fly at night. We do know that they can cross the Great Lakes and other large bodies of water. One saw-whet owl even landed on a fishing boat 70 miles from shore in the Atlantic Ocean! Concentrated banding/recapture efforts have started to fill in the blanks. One study in southern Indiana found that saw-whet owls tend to move into a territory when prey numbers are high, and move somewhere else when prey numbers are low. Deer mice are their preferred prey, along with other small critters. The study also noted that during a year when the owl numbers were below average, it had also been the worst year for acorns in recent history. This is just one more example of how mast trees send ripples far out in the ecosystem. Mast trees save up their energy for three to five years before synchronously producing thousands of seeds (acorns in this case) all at once. Since mouse populations are known to fluctuate with acorn abundance, it follows that during a non-mast year, the mouse population would be low, and the owls would migrate somewhere else. A banding study from Maryland found that saw-whets increase and decrease on a two year cycle, with an irruption (a migration in response to irregular changes in food supplies) every four years. Based on that data, 2015 should be an irruption year for saw-whets! In theory, it’s a simple equation: more acorns = more mice = more owls. In nature, I know that nothing is quite that free of complications. No matter why he’s here, I’m excited that the smallest owl in eastern North America is beeping in my woods. Without feathers, the saw-whet owl is the same size as a robin (another sign of spring that’s singing in my woods). With feathers, he is an adorable, top-heavy oval of brown-and-white-streaked fluff with expressive yellow eyes. If he’s lucky, a female will arrive soon; responding with her own series of whistles. To seal the deal, he must fly in circles, and then present her with a gift of food – the limp body a mouse. If they decide to breed here, the saw-whet couple will likely place their nest in an old woodpecker hole, excavated by the pileated woodpeckers or northern flickers that also frequent my woods. She won’t do any interior decorating, but just starts her family on whatever debris is at the bottom of the cavity. If the mice are plentiful, she may lay up to eight eggs. Perhaps it’s a little early to throw a baby shower for my new visitor, but I’m thrilled at this addition to the neighborhood, and wish him a well-fed and productive spring. As my winter legs pumped hard on my summer bike, I tried to analyze the contents of each huff and puff of air entering my lungs. From the gritty pavement and slumping roadside drifts came the metallic, dusty smell of pulverized road sand. While not exactly the fragrant perfume of spring I was hoping for, it was still a novelty for awakening senses. The swamps seemed strangely quiet, though, since the dawn chorus of thrushes, veeries, vireos, and warblers has not yet arrived. I made do with the raucous noise of a crow. Just a couple days later, after a fully-thawed night, I stepped out into a morning thick with the aroma of rotting leaves and breathing soil. The pale lavender sky seemed gentler than usual in this warmth, softened by the return of humidity. On logs and stumps where the snow had already slipped away, green mosses shone with damp triumph at the return of liquid water. I couldn’t resist reaching out to pat one particularly fuzzy patch. Sharing the moss’s rock were a few little clusters of pixie cup lichens. Pale green, living goblets only half an inch tall sat ready for a banquet among a delicate cluster of squamules (tiny cornflake-like scales). They were damp and pliable. The crustose lichen coating the rock also felt damp and slippery. Nearby, though, on a higher log, some leafy foliose lichens still felt brittle and dry as they waited patiently for spring rains to follow the melt. “Lichens master the cold months through the paradox of surrender.” observed David George Haskell in his wonderful book “The Forest Unseen.” As I wrote last March, lichens don’t fight the cold, dry, winter air. Lichens allow themselves to gain and lose water as the relative humidity fluctuates. During dry spells, a lichen thallus (leaf-like structure) might only contain 15-30% water, and it goes dormant. Freezing temperatures don’t seem to bother them. With as little as 60% relative humidity (it’s up to 84% today), moisture will seep back into their cells, the surface will become translucent, and photosynthesis can resume within minutes. “Plants shrink back from the chill, packing up their cells until spring gradually coaxes them out. Lichen cells are light sleepers. When winter eases for a day, lichens float easily back to life,” wrote Haskell. Lichens aren’t my only northwoods neighbors easily awakened by a few hours of sun and warmth. A five-fingered track pressed into slush bore witness to the passing of a restless bandit. “So that is what I saw,” I thought to myself, remembering the flash of black and gray who scurried out of my headlights the previous evening. Raccoons spend so much time fattening up during the summer and fall that they don’t need to go into hibernation, nor do they need to cache food to hold them over. With 50% of their bodyweight in fat, they can get by without significantly lowering their metabolism or body temperature through the winter. Month-long naps suffice. During warm spells, they wake up easily (just like the lichens) and may try to raid the refrigerator. And their refrigerator is large. 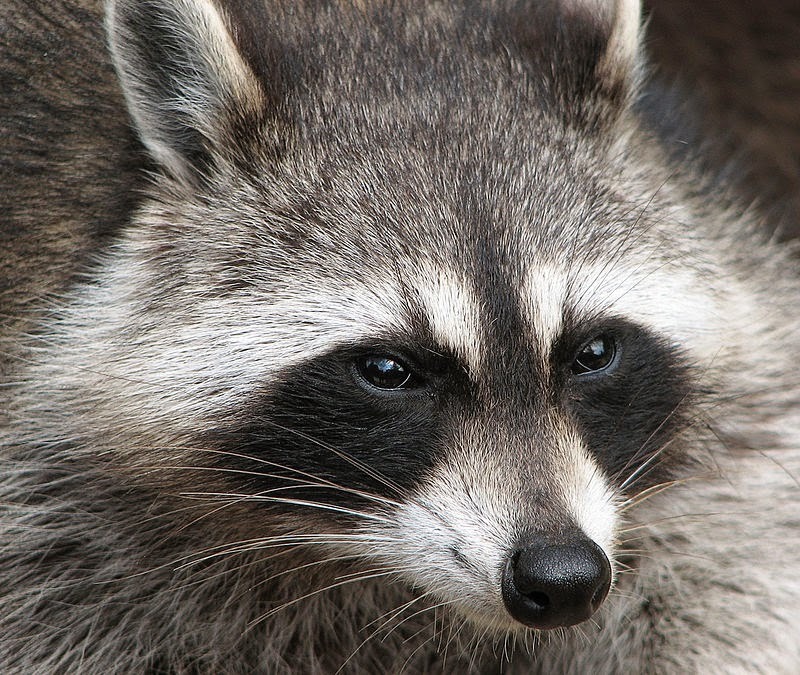 According to Sam Zeveloff, zoology professor and author of “Raccoons: A Natural History,” “the raccoon may well be one of the world's most omnivorous animals.” Their spring and summer diet consists of insects, worms, bird eggs, fish, amphibians, and small mammals. Fall brings calorie-dense fruits and nuts that facilitate the buildup of winter fat stores. Overall, their diet consists of about 40% invertebrates, 33% plant foods, and 27% vertebrates. One of the myths surrounding their eating habits is that raccoons wash their food. When they catch aquatic food – like crayfish, frogs, mussels, etc.—raccoons do often examine the food in their front paws before eating. It isn’t about washing, though, but about identifying. Raccoons’ hyper-sensitive front paws are covered by a thin, horny layer that becomes pliable when wet. Tiny hairs nestled near their claws even allow raccoons to identify something before fully touching it. To process the abundance of information from their hands, extra brain space (more than any other animal studied) is devoted to interpreting tactile impulses. My neighborhood raccoon might have trouble finding open water for foraging and feeling right now. But spring is rushing in, and soon the sun, rain, and returning life will provide all of us with abundant stimuli for our awakening senses. For over 45 years, the Cable Natural History Museum has served to connect you to the Northwoods. Come visit us in Cable, WI! The current exhibit, “Nature’s Superheroes—Adventures with Adaptations,” will remain open until March 2015. “Lake Alive!” will open May 1, 2015. “Let’s start with the evergreens,” I told the small group who’d showed up for my Ski-By Tree ID program. Picking up a white pine bough, I plucked off a bundle of needles. “Pines cluster their needles in a group called a fascicle,” I lectured, “and they are held together at the base by a sheath.” Fascicle is one of my favorite botanical words, and I loved watching these newbies roll it around on their tongues. After years of formal training in plant identification, I’ve acquired a lot of vocabulary words that I don’t get to use very often. Folks humored me, nodding their heads in understanding. After examining a couple more evergreens, we turned to the jumble of bare sticks I had spread on the table. To most people it would look like a pile of junk. To me, it looked like a gathering of old friends with easy-to-see differences. The vocabulary started flowing. Maples, ashes, dogwoods and viburnums have opposite arrangement. Their twigs and buds sprout directly across from each other in pairs, while other trees place their buds and twigs singly, in an alternate arrangement. This is a good place to start your ID. Then check out the buds more closely. Buds are miniature packages of new growth, pre-formed last summer, and just biding time until they can burst open in a furry of new growth and elongation. Baby leaves, twigs, and flowers may all be crammed into the same bud, or special buds may hold the flowers. Tiny, tough, modified leaves cradle all that tender new growth, protecting it from desiccation. These bud scales give great clues to a plant’s identity. In sugar maples, the bud scales are a rich caramel color, and they are imbricate. Another one of my favorite botany vocab words, imbricate means overlapping like shingles. On red maples, the scales are imbricate, but there are fewer of them, and they are arranged symmetrically in pairs. If the scarlet buds and new growth on red maples aren’t enough it give away their ID, the buds also have distinctive “ciliate margins” of tiny white hairs edging each red bud scale. I could see the gears turning as people squirreled away this information in preparation for the quiz. Shrubs always seem the most difficult to identify in winter, since they’re smaller, and lack the distinctive bark of a paper birch or red pine. But if you look closely, the ID is in the details. Beaked hazel is one of the most common understory plants in these woods. Also known as “bear nut”, they are an excellent wildlife plant. From afar, they look like any other spindly shrub. Up close, their fuzzy, two-toned buds are quite handsome. Just two or three dark brown, imbricate scales clasp the bottom of the bud. The light brown, inner scales toward the tip are almost valvate (a term that means two symmetrical scales that come together like a clamshell.) They are also pubescent. The fine hairs that cover the scales serve to protect the bud from cold and dryness. In the spring—before the leaves unfurl—a tiny, red, octopus flower will sprout from the tip of the bud. In the leafless woods, wind can easily bring it a dusting of pollen. That pollen comes from tiny catkins on the hazel. In spring, they’ll elongate into pendulous yellow strings of flowers. Right now, the catkins are tan, fuzzy and compact. I think they’re cute, like a teddy bear’s arm. These buds and catkins all formed last summer, while leaves still clung to the trees. It’s in the tree’s best interest to make buds while the sun shines, and energy is plentiful. So there is only a brief time—just after spring bud break—when there are no buds to look at. Fascicles. Arrangement. Imbricate. Ciliate Valvate. Pubescent. Catkins. This language may seem complicated and excessive, but for humans, to name things is to see things, and vice versa. As the students skied away to test their new knowledge, I hung back for a second, savoring the beauty of fresh snow in the winter woods, and the words I have to see it with. Scarlet petals erupt from the tip of a beaked hazel bud early in the spring. The male catkin remains closed just a little bit longer to encourage cross pollination with a different hazel bush. These tiny features make plant identification easy, if you know what to look for. Photo by Emily Stone.Beaked hazel flowers are a tiny sign of spring, Unfortunately, I didn't take this photo recently!